Google to pay $1.3 billion for Waze? A published report from Israeli, where crowd-sourced navigation app Waze is based, says that Google is about to purchase the company for $1.3 billion. Last month, Google was linked to a possible purchase of Waze along with social networking site Facebook. The latter dropped out of the bidding just as May was coming to a close. Other big tech names like Apple and Yahoo were also said to be considering a purchase of Waze at one time or another, with Apple looking to use the service to gloss over its failures with Apple Maps. The potential hokup with Facebook, which could have broadened and enhanced the social networking that the Waze app offers, fell apart because Facebook wanted to uproot the Waze team from Israeli and move them to Facebook HQ. For its part, Google has already purchased two Israeli firms and left the operations of both in that country. 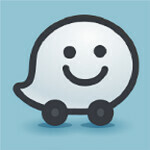 Waze uses signals from subscribers' phones to generate real-time traffic reports. The app then sends out the best route for travelers based on traffic conditions reported from other Waze members, and other factors such as construction and accidents. Police radar traps are revealed to subscribers along with low gas prices. Interestingly, Microsoft was an early investor in Waze back in 2009, but has passed up investing in later financing rounds. With the rumored interest in Waze, it would not be surprising to see a bid from Google kick off a bidding war for the company. Perhaps that explains the higher bid rumored to be coming from Google, 30% above the $1 billion previously mentioned in earlier speculation. Google might bid higher in order to eliminate any competitive offer for the company, which has close to 50 million users. This would be great, if they could integrate Waze into Maps. I've been saying this for years... way back to "Google Buzz"... And now it is hopefully becoming a reality... Google is the best to get it, otherwise if Apple or Microsoft gets it, they will kill other OS's support for Waze.. Google instead cares for broader user base... Waze is the best Navigation app in my country due to the fact that Google Navigation is not supported here. That's so cool, soon we'll be able to do it the Google Waze'!! I want Google Waze Now! I find Waze is much better than Google Maps at both providing traffic information and picking the best routes. It can alter the route on the fly if it finds a better route in response to changing traffic conditions.